There is this band from Kerala, they are named after a vegetarian dish eaten with rice and they sing in Malayalam, the most incomprehensible of Indian tongues. Despite these shortcomings these guys have managed to cut a niche in Indian music space. It really doesn’t really matter what language your music is written, for instance I remember one of my friends blogging about Rammstein’s growing fan base in Kerala. The thing is, if it sounds good that’s good enough. I am not downplaying the importance of lyrics or anything but just stating a fact. The band is Avial. 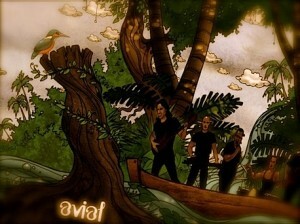 Avial exploded into our consciousness four years ago through a video called Nada Nada,basically it means “walk walk”. With their angry lyrics, turn table heroics and frantic head banging I thought these guys were just aping Linkin Park (which proved to be grossly wrong). But even then, one couldn’t help but notice the sheer audacity of singing in a vernacular of a populace which despite having a long tradition of loud music and loud sounds had somehow learned to despise rock music as noise. The hatred for rock and roll may be attributed to the Malayali resistance to imperialist designs. Even though Avial sings in Malayalam and borrows the folk songs for lyrical content the way they package their music is so ingenious, that the end product is so universal. Avial sound is truly global, it has shades of electronica, influences of various world music genres and all these influences are built around a tight arrangement of guitars and drums. They are loud, the rhythm section is power packed, the bass lines are very expressive; all the hallmark of a great rock band. What really differentiates Avial from others is that their music is designed with lots of thought, when Nada Nada was released it was much more raw and heavy and then they released with a newer version; a kind of remastered version but in fact there was more to it than that. The Avial sound had evolved meanwhile and had become intricate and interesting, the rhythm patterns became complicated, the lead strings came to the foreground. Avial uses lots of programmed music and their mixing is world class. Avial has created a sub genre of alternative rock, the malayalam alt rock, I hope this is just a beginning and more bands will follow the trail blazed by these pioneer rockers. The Avial’s current line-up comprises of Tony John, the vocalist and turn table specialist, Rex Vijayan, the lead guitarist, Benny Isaac and Mithun Puthenveetil. Rex Vijayan was part of Motherjane during the 90’s. He is also part of a fusion outfit called (Karnatriix is a fusion delight, check them out). He is a master guitarist and a man to watch out for. Note: The place I went to watch Avial’s performance has a bar, they had a special cocktail created for the evening. It was drink mixed with a coconut water and was served in the coconut itself. They had named it, son of a beach, lol! Thumbs up from a big avial fan here!!! thirst for more of son of a beach and of course avial. Thumbs up for Avial!!! Keep rocking brothers.